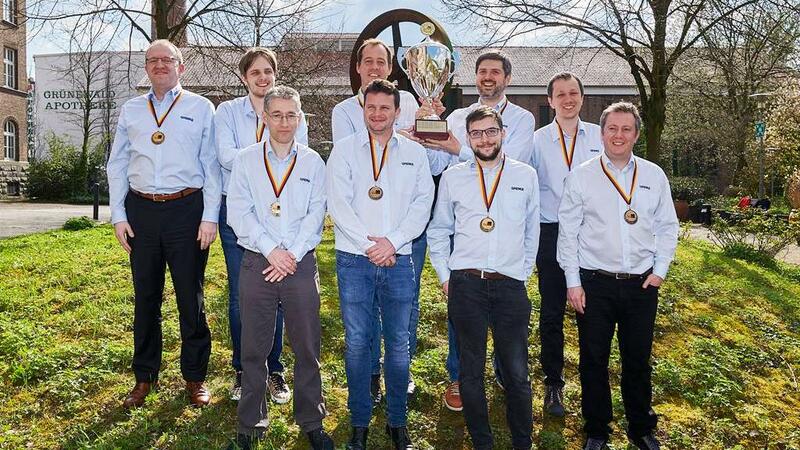 With Levon Aronian, Maxime Vachier-Lagrave and Peter Svidler in its line-up in the final weekend, the German chess club Baden-Baden clinched its 13th Bundesliga title in 14 years, more than any German club ever achieved. Early March we covered this season of the German club championship for the first time. In the joint weekend in Berlin, Baden-Baden was held to 4-4 twice and had to share the lead with Solingen, with two rounds to go. Last Saturday and Sunday was the final weekend in Solingen, and there things went much better. Always the favorite in the league, Baden-Baden emerged victoriously again. The key match was on the first day when co-leader Solingen, the host club, was the opponent. The match was won 5-3, where all of Baden-Baden’s Black players drew, and their White players scored 3-1. Maxime Vachier-Lagrave defeated Pentala Harikrishna on board one, but less convincingly than expected from the opening position he got. Something must have gone wrong with Hari’s preparation, because he followed a line that his compatriot Vishy Anand had played against the same opponent last year, all the way until he was in a worse endgame. MVL needed 24 minutes on the clock for the novelty 19.Ree2, which he remembered was good but it needed some calculation. The French player then continued with a few more strong moves, won a pawn and soon had a winning position, but the remainder was not played perfectly. Vachier-Lagrave going through his game for the Grenke YouTube channel. Peter Svidler defeated Loek van Wely, who was recently elected as a member of the Dutch Senate for the political party Forum for Democracy. Van Wely intends to accept this new role, which means he will be appointed on May 27. The game seemed like a pretty smooth victory for the eight-time Russian champion, but in reality there were some hidden errors. The fact that both players were somewhat under the weather might have played a role there. In the video below, Svidler first shows that he almost went for a long line that would have lost for him, and then there was another nasty tactical detail, which he noticed right after the game. “I tricked Loekie a bit,” Svidler admitted. Svidler going through his game for the Grenke YouTube channel. Solingen could only put one win on the scoreboard. Danish grandmaster Mads Andersen defeated Paco Vallejo as Black, turning a 6.h3 Najdorf into some kind of Rubinstein French where White’s early g2-g4 thrust became mostly a weakening of his kingside when White made an unfortunate knight move. On the last day of the season, Baden-Baden maintained its two-point lead with a big win against the team from Düsseldorf led by another Dutch grandmaster, the former world championship candidate and world number two Jan Timman. The Dutchman’s play against Vachier-Lagrave’s Gruenfeld felt fresh and creative (although admittedly, this author isn’t fully neutral here), and the 67-year-old was doing more or less OK after 28 moves. Then, an innocent-looking queen move led to a lost position, out of the blue. With their 13th title, Baden-Baden is now the record holder for number of victories. Their main rival of this season and in history, Solingen, won 12 times. “It has been a thrilling season. The strongest league in the world is getting stronger and 13 titles in 14 years has been a fantastic and intense journey. It cost me a lot of hair, but in the end it’s an incredible track record that was made possible by great players, a great club and, with the Grenke group, a great sponsor,” said team captain Sven Noppes, who is also the main organizer of the Grenke Chess Classic that starts in 10 days. Find all upcoming major events in our tournament calendar. Baden-Baden has a chance to win both the Bundesliga and the PRO Chess League this season. Although with quite a different line-up, last week the Baden-Baden Snowballs qualified for the PCL finals to be held May 4-5 in San Francisco.